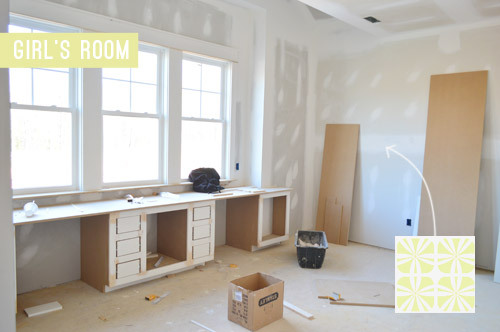 During last week’s update about our Homearama Showhouse for Habitat For Humanity, we included a few peeks at how some of the rooms were shaping up. Well, shaping up in our heads, technically, since we’re still about three weeks out from being able to put any furnishings into the house (the walls are getting painted as I type this, and then the cabinetry will go in and the hardwood floors will be stained on site), so everything has been in shopping list and mood board form so far. But in the last week the builder and his awesome team have been humming along, and we’ve made some really good furniture-and-accessory planning progress in several of the rooms. Enough that we can finally share a few room plans with you guys that are no longer missing major elements. Some spaces are definitely further along in the planning process than others, and the two in the lead are: the study (aka: the home office) and the dining room. They’re the first two rooms in the house when you walk in, so we’re grateful that they’re shaping up to be a good representation of the feeling that we want this house to have. One kinda skews light & happy while the other brings in a bit more of a cozy & moody feeling that we also really like. So we figure that together they’ll help set the tone for the rest of the house. Let’s start with the study, er, office as we keep calling it. Here’s what it’s looking like now. Since we’re sort of designing for a hypothetical future version of our family (hence the tween girl & young boy rooms that we mentioned last week), we thought it’d be fun to do a home office for a woman who works (perhaps blogs?) at home. Not only is it an easy mental leap to make, but we also thought it would differentiate it from all of the manly mahogany studies that we’re used to seeing in model homes. So light, cheery, and a smidge feminine was our goal. The walls are already Simply White like the trim, but the painters still have to put our bold accent color on the 10′ ceiling, which we thought was tall enough to handle a rich and saturated turquoise color called Skydive. This Wire Globe Lantern in rust from our lighting collection (donated by Shades of Light) will hang over the desk that will float in the middle of the room. Floor length curtains in a textured & modern feeling fabric (Dapp woven fabric in Elephant) will hang floor to ceiling on either side of the window (our favorite local fabric shop, U-Fab, is donating them to the cause). West Elm is also excited to help Habitat, so they offered up this striped Saddle Office Chair but we hear it’s on back order (fingers crossed it comes through in time). We’d love to add some chic storage boxes, like these from Target. While we’re at it, a cheery mug for pencils and other desk stuff could be fun. Maybe this one? This wood & metal desk hails from Green Front Furniture (sorry, we don’t know the maker) who is loaning furniture to all seven of the homes in the show (more on that here). Please forgive the wonky photoshopped top (I attempted to remove some display materials that were in our shot). We love this art from Help Ink, where $1 of every $5 spent goes to a charity of your selection. We’re thinking this print would be perfect, since the colors fit right in, and the message is pretty great too. West Elm was also happy to donate this Torres Wood Kilim rug in Guava, which we think will keep things casual and light. We’re also thinking about buying this Help Ink print as well. Feels nice to choose accessories with a charitable goal while decorating a house for charity. Although most of the items above are already locked in, a lot of the accessories and art are things that we’re going to purchase and fill in as the rooms get further along. So we’re sure some might change as we go, and of course a ton of other stuff will end up in each room as it evolves. But on to the dining room! 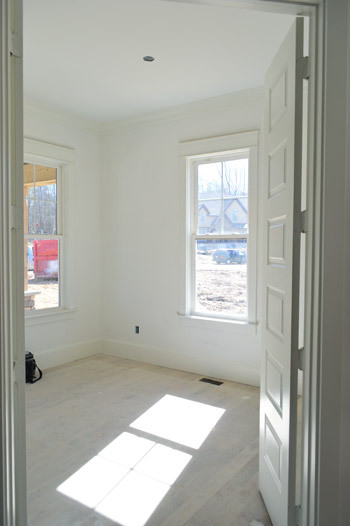 Last week it was looking like this (we’re still waiting for our big glass pocket doors with a transom window to be installed at that extra-wide entryway). But as of yesterday it had made some great progress thanks to our custom wainscot being finished and freshly painted! It’s not your typical wainscoting, but with a very talented carpenter at our disposal, we wanted to try something a little different (remember how we chatted about trying to take risks and all that good stuff here?). We thought about something like a herringbone or a chevron pattern, but didn’t want it to be too overt (like this) and were inspired by something a little more subtle and less common (oddly enough, like the pattern on these shoes that Sherry saw on Pinterest). 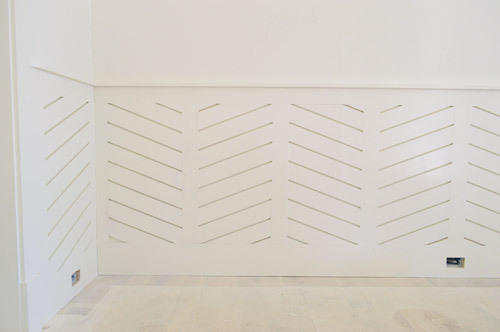 It’s a wide-angled pattern made up of wood slats with a 1/4″ gap between them, so the lines are kind of “engraved” into the wainscot instead of sticking out. Before putting it up, we literally sat with the carpenter and drew various angles right onto the walls and used different board widths and spacing methods until it looked subtle enough not to be too crazy (but not so soft that the pattern would disappear completely when it was painted). For anyone interested, we went with 1 x 3″ boards, a spacing of one quarter of an inch between them, and the angle is around 22 degrees from the floor. The upper walls are going to be Kendall Charcoal, a deep brown-gray color that will bring some moodiness to the top of the 10′ tall room. Here’s the aforementioned wainscot that we added for reference (it’ll remain glossy white, along with the trim). This is the big Industrial Modern Island Chandelier in Bronze that Shades of Light is donating for over the table. We fell hard for this Jute Boucle in Platinum, which West Elm is kindly donating. We’d also love some potted greenery as centerpieces, like these that we found on Etsy. This rustic wood pedestal table that Green Front Furniture is loaning us for the show will float in the middle of the room with the chandelier over it. Among the potted plant centerpieces, we thought a collection of old wine bottles or green vases would be a nice mix (image from West Elm). We liked the idea of dark upholstered chairs, which would pop in front of the white wainscoting. Maybe these from World Market? We’ll also be adding floor length curtains in this fabric (Stri fabric in Ultramarine, donated by U-Fab). We love that they subtly reference the angled wainscoting, and while we wanted the room to be sort of quietly elegant, we couldn’t resist some color on the window wall. Wow, I love the wainscotting. The design is very contemporary and even casual. Very appealing. And I love the story behind the inspiration…thank you for including that. Love the waiscotting! Tres unique but not overwhelming. Also love the color of the ceiling in the office. Thanks Lauren! 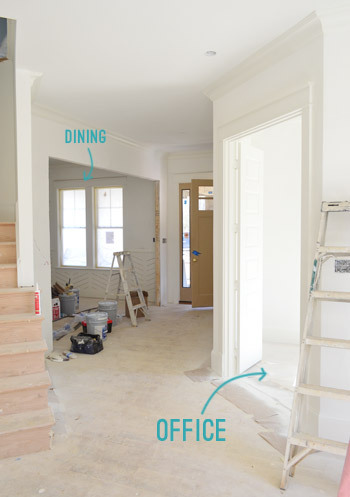 We’re attempting to do at least do one “brave” thing in each room, so the bold ceiling in the office and the linear wainscoting in the dining room were our two biggest “risks” for those spaces. We’re so excited to share the other ones in the kitchen, living room, bedrooms, playroom, etc – some are still being fleshed out, but it’s really fun to stretch ourselves like this. We just want everyone who passes through the show to come out with some fun ideas! We talked about that possibility (or using pre-planked items, like beadboard or board & batten, which already have those grooves) with the carpenter, but in order to get the lines really crisp with clean right angles like that, we really could only get the look from boards that were manually spaced. But if you didn’t mind having softer more rounded grooves I think beadboard, board and batten, or a routing bit could definitely do the trick! Oh my goodness! This is amazing. I already have my ticket. Do ya’ll mind if I drool over everything when I visit!?! Haha, thanks Angela! Drool is not only acceptable, it’s encouraged. We just hope nobody walks in and cries. Or feels sick. Haha! It’s nerve-racking! Haha, you’re so sweet Sheralyn! So, are you guys going to be at any of the Homearama days? We’d love to swing by, but we’ll have brand new baby, so we’re not sure how it’ll go (and I’ll be recovering from a c-section). The best bet is probably that last weekend, since I’ll hopefully be up and around by then, but we’re not sure how it’ll go. Will hopefully keep you guys posted! I want to dine there. Seriously. Would it be wrong when it’s finished to start whipping something up in the kitchen just to eat in the dining room? They wouldn’t mind, I’m sure. That office though!! Oh my gosh. The chair is too cute and the desk is so sleek. I love the turquoise and white paint too – that colour combo always feels fresh to me. I love that you didn’t go for the mahogany office. Much as I love the idea of a room like that, it’s nice to have some variety. I’d be curious to hear, either here or in a later update when things are more finalized, how you guys feel about “settling” – like if that chair ends up being back ordered and you have to do something else. I know you’re both fans of waiting a little longer for the perfect thing, whether that means shopping around for a few more months or just plain saving up for something spendier but fantastic. With this house since there’s a deadline when everything has to be D-O-N-E *done*, you kind of have to go the other way. Yes! That would make for a great post, because this process is so different than our usual “letting things percolate and evolve” approach! We’re still sort of learning how to deal with it as we go. Haha! So much gorgeousness my eyes hurt. I’ve got a soft spot for blueprint layouts of houses (nerdy, right). I used to draw house layouts for fun as a kid, so I think it brings me back ;) Love it all – such a fun project! I used to draw layouts of my “dream home” when I was little too! So funny! Used to? I never stopped, haha! I love drawing house layouts when I get bored. 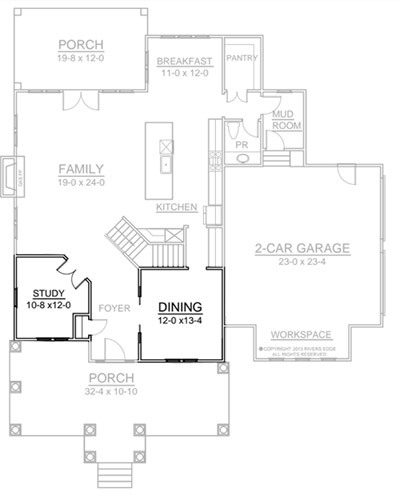 Floorplans make me waaay giddier than they should. I kept scrolling back up to the floorplan to see where everything was placed! Love! Wow, that wainscoting! I love that it’s a bit of traditional, but with a very big twist. Or slant technically. If that’s the first glance of the house then my anticipation for the rest of the house just jumped off the charts! That would look awesome in there! GAHHH I LOVE your colorful world map art!!! Did you make that? I would love it in my place. I can’t read German helpen-me bitte! LOL! The gist is: I used a projector and a cheap watercolor set from the US. If you have any specific questions, please let me know, and I’d be glad to answer them in English! This house is going to be so gorgeous! I can’t wait to see it all finished. Love everything y’all have picked out! And that wainscotting is so cool — and I love the story of how y’all designed it!! I think I may have to make a trip up there in May to see this house in person! 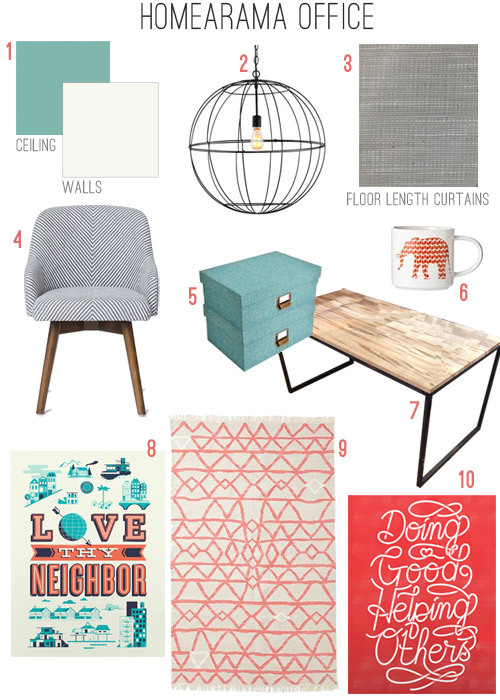 Also, I’m totally stealing the dining room mood board for my back porch makeover! I love the colors/textures/materials…everything. Now to just swap out the dining table for a loveseat and and the ceiling fixture for a few wall sconces. I am in love with the wainscoting! I’d love to do that in my house. Great job guys! I shivered a little at “glass pocket doors with a transom window”!! Oh.My.Goodness!! What a dream! 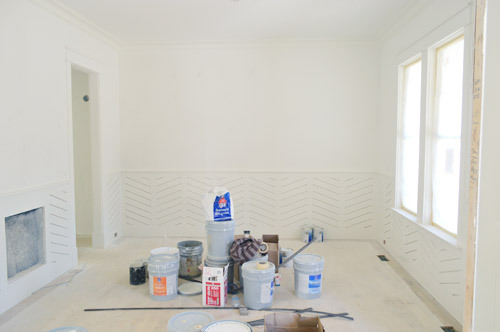 LOVE LOVE LOVE that wainscoting! Do you think we could do that in our hall with fairly heavily textured plaster walls? I think it could work! Maybe just try sanding down the texture or even skim coating it so the boards have a flatter surface to adhere to? Then caulk the top edge so it all meets up in a nice clean line? For once I am actually a bit busy at work at posting time, but of course I had to take a peak! I did a quick scroll through the post to hold me over (I may be a YHL junkie…) and I am in love with the wainscotting!! I want that office. Can I buy just the room after this is all done? Haha. I LOOOVE THAT CHAIR! & that desk! So cool! Wow, all those cuts = dedication! I have a question regarding the jute rug in the dining room…any insight as to durability? I’d love to do a jute rug in my dining room but i’m concerned that it will get torn up with the regular rubbing of the chair legs against it. We do all of our eating in our dining room…and I have 3 kids ;) Thanks! Anyone have tips for Stacey? We used to have a jute rug in the kitchen of our first house and it held up well for years (although no chairs rubbed on it, it was almost straw-like in the construction so no stains really stuck to it, and could be wiped right off). We have a jute rug underneath our dining table. That is where we do all our eating and we have 3 boys who aren’t the neatest of eaters :) It has help up great. No fibers have come undone and it cleans up well. The only problem we had is a piece of chocolate cake got ground up into it and I can’t get it all out. Otherwise we have been very happy with it. We have the Jute Boucle rug from West Elm that John & Sherry are using but in a different color. I would be a little apprehensive about putting it in your dining room if you use it all the time. We have it in our family room, no kids yet but two large dogs and it’s starting to unravel in the high traffic areas (like in front of the couch and on the edges). We’ve had it for about 2.5 years. I don’t think this is the case for all jute rugs though, maybe just this one? I don’t know if you mentioned it before, but does the house have a basement? It doesn’t. I think one of the seven does, but here in Richmond they’re not super common, so maybe one in every three to four houses usually has one? Great mood boards. I especially love the office one. Coral is just so pretty. I’m loving that as an accent color these days. It’s so fresh and vibrant. By the way, are you guys writing a second book? Noticed your instagram photo. Maybe I missed the news?!! That would be fabulous! Your first book sits on my coffee table for doses of lovely inspiration. Aw thanks Steph! We signed a two book agreement, so we’ve offhandedly mentioned that a few times (before the first book came out, etc), but the time has come to actually start working on book number two. We’re really excited about it, and hope to share more details soon! Wow!!! I was planning a wainscoting treatment in my bedroom but whoa! That design is gorgeous! I can’t believe how excited I am to see this house come together. I finally got a post up with some major craft room progress, and even included some love for YHL! Thanks so much Lisa! You’re so sweet! And your craft room looks awesome. I had this beautiful, odd shaped candle that I found on a clearance table at a Hallmark store. I burned the candle and still loved the purple and white glass container that it came in. I cleaned it out and for the past four years, it has sat on my desk holding pens and scissors. Everyone at work comments on how nice it is. :) Cute flower pots also work really well for this purpose. Some other options to consider if you aren’t sold on the mug route yet. Such fun spaces. I love seeing the planning that goes into a room. It really makes me miss the days when you did custom mood boards; so grateful you still have them all available for drooling…er I mean viewing! 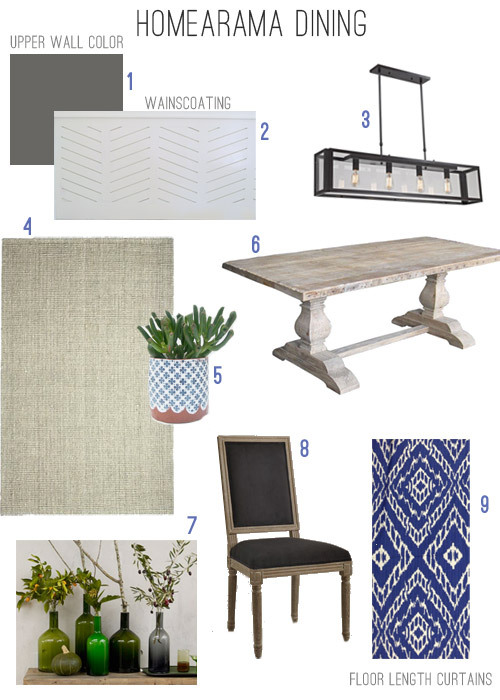 Love the mood board for the dining room! 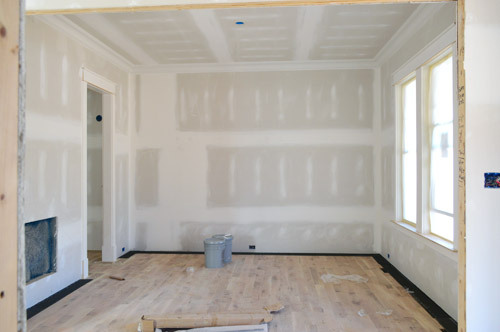 The wainscoting will be the perfect accent to makes that room! Love the dining room aesthetic! The engraving in the wainscoting is too cool! And it’s really going to POP once you add paint, can’t wait to see it! For now it’ll be white like the thick crown and the wainscoting, but we’re not sure if we’ll do it a half-tone of the walls or something else (light metallic?) once the room starts to come together. I love your ideas so far. I can’t wait to see how you hang the curtains with the high ceilings. We have 10ft ceilings downstairs and long windows (78 inches tall) and most of the windows still need curtains. I am excited to see how you dress the windows and how you hang the curtains. We’ll definitely share those details! It feels like a whole new world to have high ceilings to deal with, but we love how much it opens up possibilities for things like hanging light fixtures. You’re so lucky to have them! Wow!!!! Love both spaces! You are definitely achieving the “something different and exciting without being overboard” in my opinion! Good work can’t wait to see the whole thing! That wainscotting is amazing!! I’m in love. Does working on this house ever tempt you guys to change direction with your jobs? I know you love having the blog about your home, but you seem to be really enjoying the process of decorating for others (and I’m really loving the results). I imagine the freedom to take more risks would be something that might tempt you to want to do more of this type of work. Anyway, just curious … I wouldn’t mind reading about more of these types of projects in the future and I’m really looking forward to the results of each room in the show house! Just seeing all of this makes me wish we had an office, or space for one, in our house! My husband has one, but we will have to turn it into a nursery when we have kids. Oh. Em. Gee. I love this so much I hate it. I totally see your vision and it makes me want to move into this house immediately. I seriously feel pain in my heart I love this so much. I am in awe of you two. You’re so sweet Jessica! Thanks so much! Of course! It’s one of those things where we’re on site and we’re snapping photos or planning ideas and we stop and say ‘ahh, can’t wait to share this’ – we’re nerds for blogging about this stuff. It has been such a different process than the evolve-over-time method that we’ve used at home all these years! Oh my … I just swooned a bit. I love every detail of both rooms. Thanks for the mood boards, they definitely gave me some ideas to take into my house! YOU GUYS. That wainscoting is amazing. Bravo!! Thanks so much Stephanie! We have to tip our hat to the builder and his amazing carpenter. They’re the dream team right there. We’re just the weirdos drawing on the wall and sharing photos of shoes with them. Haha! I really love everything you’ve done to this house so far, and I’m so sad that I won’t be able to see it in person! Thanks so much Melanie! We’d love to do a video tour to share after the show wraps. That way hopefully everyone can feel like they’re walking through the house. The dining room is shaping up nicely- love the blue of the curtains- but I would re-think that rug; the table will just “melt” into it, color wise, IMHO. Something overdyed in cobalt/navy/purple/indigo might be good? Maybe sometime in May or June? Haha! Otherwise, the plans look great! Oh no! Thanks for the tip Maya! It is coming along swimmingly, you guys!!! If I’m reading between the lines correctly, you guys are grinning and bearing it while being so grateful for this opportunity- stressful as it is. When I was pregissimo with my first, I was finishing undergrad (18 credit hours. No, the double major hasn’t made a difference.) Plus working two jobs and trying to make ends meet with no insurance. T’was stressful indeed. This pregnancy we have insurance (yay!) but we’re still working 3.5 jobs between the two of us, raising a toddler and finishing grad school. It’s time to end the graduation-while-pregnant thing! That long ramble to say: guys let us know if you’re crying at night. We get that trying to make these decisions on a crazy deadline while blogging, writing a book, growing a bun, tossing your cookies every morning all while handling the curveballs life hands you – like washing machine drama – is uber tough! We are all cheering for you and praying for the Petersik family. Aw, thanks so much Kati! We just try to reminded ourselves that we’re two people and we have a “max capacity” – so although everything from the showhouse and book #2 to this baby on the way, and our secret project are SO EXCITING, if we ever reach our “tipping point” something will just inherently have to give. So far I think we’re doing well (dropping a few balls, but rebounding decently, haha!) but we’ll definitely let you guys know if that ever changes. For example, we have no idea what kind of baby we’ll have, and most newborns are a full time job for a while, so we might have to make some adjustments when the little guy gets here. Then again – we blogged right through having Clara (via emergency c-section) so we have no idea where we’ll end up! So in love! I’m already trying to decide if there’s a room in our house where I can do that wainscoting. I’m a herringbone addict, and your version is so chic!! I’m in Northern VA, so I may have to convince the hubs to take a day-trip to Richmond when the show is going on, to soak up all the YHL goodness in person. Aw thanks Sally! Come on down! Love the design of the wainscoting but the practical side of me is screaming How in the heck will you clean between those boards?! They’re sure to collect dust and dirt. Maybe a little too form over function? We have horizontal paneling with grooves that collect some dust in our kitchen and living room, but I just run a swiffer duster along them and it seems to work out well. Although the groves are less crisp and more rounded in our home, I think the same method should work at the showhouse, and since the house is a dusty mess (and won’t be opening for two months) I can test a few things out and share what works best! And now, for something completely off topic, my 5-year-old recently got her first loose tooth. (It still hasn’t fallen out.) Anyway, I was randomly inspired by your April Fools Rap video last year, to make a rap video about it to announce to our family! Check it out if you have two free minutes, it turned out well! Anyway, thanks for the inspiration! Bahahahahahahahahaha! It’s amazing. And now I’m singing it. Also, Clara gives it ten thumbs up (and wants to watch it fifteen million times). That is so good Cheri!! I love it!!! And also singing along now hahaha! I bet that took a lot of solid work! Sherry, another april fools music video perhaps? pleasplease!!!! it’s my favourite thing ever! I would totally do another one. Except it wouldn’t fool anyone. Also John says “never again.” Haha! John you forgot to mention photos of the 2nd book starting, in your buckle up and hold on sentence. You two are amazing. You could of easily broken this into two posts and given yourself a day off ha! Don’t know how you do it all. And where all you inspiration comes from. The art in the office is a great choice. You two are great people. Wish there were more like you in the world. Thanks so much Alison. You’re too kind.